he FLOW OISTINS FISH FESTIVAL in Barbados is a street fair with a week of events climaxing on the Easter weekend. This event started in 1977 and commemorates the signing of the Charter of Barbados. It is also held in honour of the fisher folks in Oistins and persons who have contributed to the Barbados fishing industry. The Oistins Festival showcases a variety of local and regional delicacies, art & craft, live music and cultural entertainment such as the steel-pan and tuk-band. Two of the main attractions are the fish boning competition and the climb-the-grease-pole competition. Some of the other competitions are the crab racing and boat racing competition. The Entertainment is centred around the Flood Lit Tattoo, the Gospel Festival and the Heritage Village. Every year attempts have been made to enhance the uniqueness of the festival by focussing its activities around fish. The main objective of the event is to demonstrate how a number of Caribbean Community countries prepare their ‘national dishes’ with a particular emphasis on FISH. For this year, countries would not be taking part in a competition. Rather, each country would seek to demonstrate its own food preparation. The Oistins Fish Festival is held in Oistins Town which is home to the Oistins Bay Garden and the popular Oistins Fish Fry. 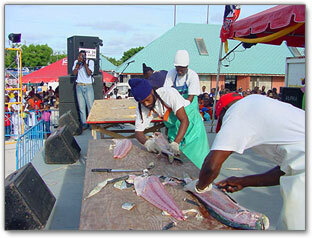 The Oistins Fish Festival was founded by Stella, Lady St. John, in collaboration with communities groups, the most prominent, of which was Hill Tops. Originally the festival's goals were to improve the economic fortunes of the fisher-folk at Oistins, enhance their social status in the community, raise the entrepreneurial skills of the fisherfolk, and highlight Oistins as a major fishing community. To achieve these goals, the Oistins Fish Festival was created as an Easter street fair, starting on the Saturday before Easter and continues throughout the weekend, ending on the Monday bank holiday. Over the years this festival has attracted many people, both from Barbados and the region. The main event of the festival is the Fish Boning Competition, which is very competitive and an essential art form to the fishing industry. Other events that create heightened spectator interest are the Dolphin Skinning Competition, the climbing of the Greasy Pole and the Boat Race. Patrons also look forward to the Gospel Festival on the Easter Sunday. Bring the entire family let's have a fun Day out! Send Oistins Fish Festival 2018 Postcard to a friend!